During my stay in Italy I spent many days lying on the beach (Amazing, I know). My face started to look like a leather catcher’s mitt and my forehead was an oil pit. I went to the local pharmacy (apparently the pharmacists in Italy know more than the doctors, so much for socialized medicine) and asked the pharmacists what I should do about my face situation. She recommended using a mild gel cleanser twice a day and for sun protection she recommended Vichy Laboratories Capital Soleil SPF 50 Ultra Light Sunscreen Fluid. I cleansed twice a day, morning and night, and reapplied the SPF around every 2 hours. This combo got my face looking substantially better in about 3 days and I was still getting a healthy glow. It was a miracle. 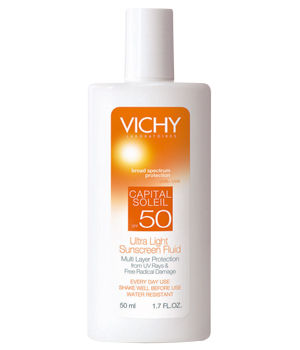 The gel cleanser brand she recommended isn’t sold in the U.S. (go figure) but I came across the “Vichy SPF” online. You only need a little bit so you have to be careful when you pour it out because it’s very liquidy/runny and you don’t want to waste (trust me, this stuff is liquid gold). It’s pricey, $19.50 plus shipping, but isn’t your skin worth it? Find it at www.vichyusa.com. Happy and healthy tanning!